In case you missed it, FX renewed The Strain for a second season. Congratulations to both the cast and crew. Despite any of The Strain’s problems right now, a second season can allow it to learn and grow from its mistakes; nothing would ever be gained from a one-and-done series. Luckily, The Strain is improving as the weeks go by and more characters either figure things out or become vampires. There are still moments of frustration with the characters—Eph is often the source, which is a whole other discussion—but the show is now doing this more in the service of its horror roots. When Setrakian says the above line, it not only points out Eph’s major flaw but coincidentally brings up a few of questions for the audience. What is The Strain about? Who is it for? What is it trying to say? To simply deem the show mindless fun (or even mindless torture) that you have to turn off your brain to watch it is doing somewhat of a disservice to all those involved. The execution may not be there, but the intent clearly is. The Strain isn’t solely working on a surface level, and while it may not be succeeding at its goals, that doesn’t make the attempt any less present. 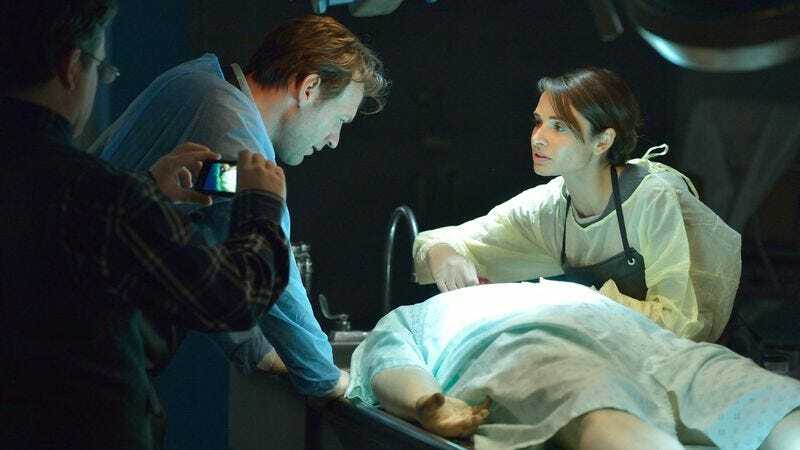 ”For Services Rendered”—which is actually better than last week’s “Occultation”—is The Strain’s best example of the type of show it presumably wants to be and the story it wants to tell. It doesn’t erase the first four or five episodes of the series, but it sets a good pace for the future. It’s too early to call it a perfect episode of The Strain, but it combines and balances aspects better than any episode prior. There’s horror. There’s action. There’s character work. Even the flashbacks to the concentration camp—which felt shoehorned in last week—serve a purpose, both as a functional part of the plot and as a character-based study. This episode is the closest The Strain has been to good from beginning to end, with the biggest hiccup being Setrakian’s plan to get to The Master. For every tidbit Setrakian spouts about the vampires, he doesn’t take into account Eichorst’s knowledge of him or his heightened vampire senses. Eichorst knows it’s a trap from the moment Jim calls Palmer, simply because—as seen—Jim has absolutely no spine. Where the plot works, however, is in depicting the increased pandemonium in New York and how it’s not just the normal chaos of the city. And with that and Setrakian’s logic line, The Strain finally achieves a self-awareness that is absent in those first few episodes. In “Runaways,” I commented on the Luss family nanny, Neeva, being an example of the show’s intelligence problem, by choosing to simply kidnap Joan’s kids instead of calling someone who could help. The problem itself wasn’t her taking the kids (Joan‘s humanity was clearly not long for this world) but in there not being a part of her plan that involves trying to get help. Part of the blame belongs to the writers making Joan the last plane “survivor” to get any real focus. While the captain and Ansel both got their days in the metaphorical sun and the Bolivar plot goes on, Joan surprisingly didn’t factor back into the greater story until “Runaways.” Now, she is completely out of the picture, but at least she is wonderfully terrifying while she lasts. At the start of the episode, Neeva tries to warn Roger Luss (Aaron Douglas, Battlestar Galactica) as best as she can about his wife’s sickness. But it’s her failed attempt that leads to one of the better horror sequences on the show so far. As soon as Roger takes a cab ride home and realizes that one of his neighbors has become something, he smartly attempts to high tail it out of there, only for the very rude cabbie to do nothing but continually ask what it is. It’s a typical horror set-up, with Roger’s exclamation for the cabbie to “Drive the goddamn car”echoing the audience’s own thoughts and vocalizations from the other side of the screen. The urgency remains as the cabbie gets out of the car to shoot the vampire, only to immediately become its next victim. Then, once inside the safety of his home, the show twists the knife a bit more with the prerecorded voice on Roger’s cell phone stating that service had been suspended in his area. All while the true threat looms. It’s the next level version of those music cues The Strain employed in its first two episodes. Roger’s fate is sealed as soon as a fully-transformed Joan appears and the title card—as well-timed as it’s ever been—pops up. With Neeva’s daughter, Sebastiane (Shailene Garnett, The Best Man Holiday), her fate is sealed as well, as soon as she decides she and her mom should return the kids to their parents. Her matter-of-fact “I’m a nurse” essentially signs her own death warrant. The Strain is learning to succeed in delaying the expected without drawing it out for long that there’s no longer any interest. Sebastiane and Roger are one-off characters, but that’s all that’s needed of them in order to move along the plot. Fate being sealed actually plays a big role in The Strain. As mentioned last week, a lot about The Strain takes the position that there is no God or at least no power in faith-based beliefs. Eichorst himself even calls Team CDC “on the wrong side of history” because of their belief that there is anything they or anyone can do. With these rules, the audience knows that Neeva praying as she and the kids hide in the Luss house isn’t going to do anything at all. But then comes “divine intervention” in the form of another vampire. It’s the game changer at the end of the episode: the vampire who hunts his own kind. Even at its weakest, The Strain has tried to end each episode with a moment that makes the audience want more, and this revelation is no different. There’s intrigue, and he doesn’t even have to be an alcoholic with an Alzheimer-ridden mother, in the middle of a custody battle with his sick wife to achieve that. This new player’s introduction actually calls into question how exactly vampire sentience works in this universe. The new vampires we see are pretty much feral, zombie-like creatures, while vampires like Eichorst and this new one are undoubtedly intelligent beings. Is there anything that sets them apart, or is it simply an age thing? Is there a vampire equivalent of Muzzy or Hooked On Phonics? There are still a lot of questions to be asked about The Strain, but the show is heading in an interesting direction. The first half of the season set the stage, but finally, the show is using it. Billy Zane Hair Update: I didn’t even think about how bad the hair has gotten—that thing was clearly not made for action—while watching this episode. Like last week, the Gus storyline actually works here. Again, the writing is on the wall, as he and a transforming Felix are kept in a packed lock-up. The Guardian headline “BOLIVAR CONCERT ECLIPSED” is the kind of awful humor that’s much appreciated. It’s so groanworthy that you can’t help but laugh at how ridiculous all of this is. Even better are all the “IF YOU SEE SOMETHING, SAY SOMETHING” signs. This should be the show. In addition to the phones and Internet failing, subway construction and the Brooklyn Bridge closure are also ruining New York. Richard Sammel is phenomenal as Eichorst. He’s such a haunting menace, especially during the flashbacks in this episode. Every time he calls Setrakian “Jew” is absolutely nauseating, but in the best way possible. Everything he says is so uncomfortable. So, Setrakian built the box/coffin, putting some of the blame for all of this on him.